A NASCAR track is a fast-paced place to practice physical therapy. Drivers whip around the track at 200 miles per hour. Pit crews race to change 75-pound tires and empty 100-pound cans of fuel into the cars in 10-second pit stops. Occasionally, team members have to dodge a car. S ometimes they get hit. Jena Gatses ’15 DPT has spent almost two years in that world. She keeps the drivers and pit crews of the Joe Gibbs Racing Team functioning at the top of their game by designing exercise regimens and treating injuries. She loves working in an athletic environment where her goals go beyond helping patients relieve pain, but to challenge their bodies to excel. “The sky’s the limit,” she said. Jena worked in the fitness industry before she came to University of Lynchburg, and her professors allowed her to arrange unique clinical experiences and internships with her contacts in the industry as she earned her doctoral degree. While she was in Charlotte, North Carolina, for one internship, she reached out to the athletic director on the Joe Gibbs team and offered to help out. After she worked at a couple of races, the team asked her to come on full-time. She asked the team to wait until she finished school, but she continued to help on weekends when the team competed in Virginia. As soon as she graduated and passed her board exam, Jena became one of the few physical therapists working in NASCAR. 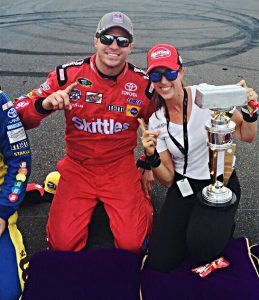 She’s been on the sidelines providing treatment as the team has raced to many victories, including Kyle Busch’s Brickyard 400 first-place finish in 2016. During one race, Jena got to step in for an injured pit crew member and lug the heavy tires off the track. As a CrossFit enthusiast, she had no trouble. “It’s hard to be accepted in a male dominated sport. You have to work hard and get their respect by standing your ground,” she said. 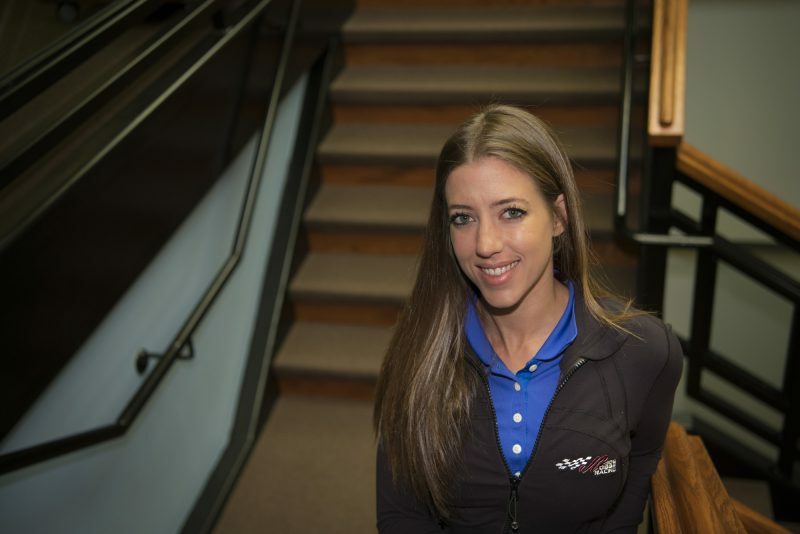 In addition to her job with the Joe Gibbs team, Jena has her own business, Scientific Fitness, through which she provides physical therapy services as well as training videos to clients. Jena recently returned to Lynchburg to tell current students aspiring to medical careers about how they can follow in her footsteps. They key, she said, is to think outside the box and pursue their passions. “Whatever you want to do, you can do it, even if people tell you can’t,” she said.